If you like having quick week night dinners – and if you don’t, what is your time management secret? – then you will want to save this recipe. I always have the couple ingredients on hand needed for this Hawaiian Ham when I know we are going to have a busy week. It takes under 15 minutes to prepare and requires 1 dish for the entree. Plus, unless you completely forget you were cooking something on the stove, it is hard to mess up because you are really just heating the ham steak. I almost feel lazy for sharing it here with all of you, but maybe some people have never tried it before. 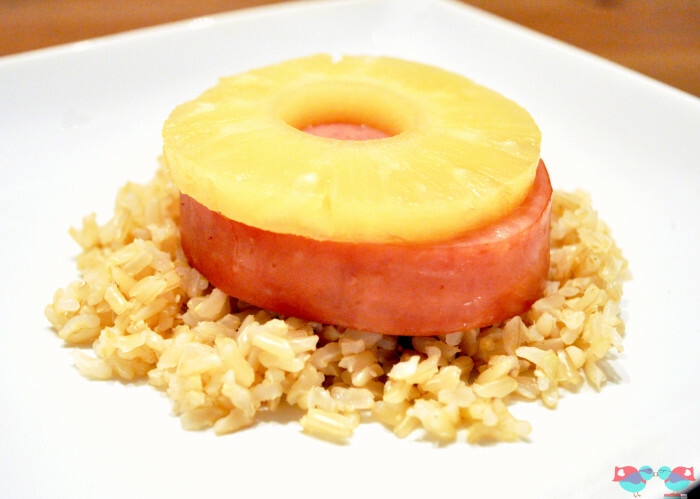 I mean, while simple, pineapple and ham are just so delicious together! Place the ham in a stove top pan. 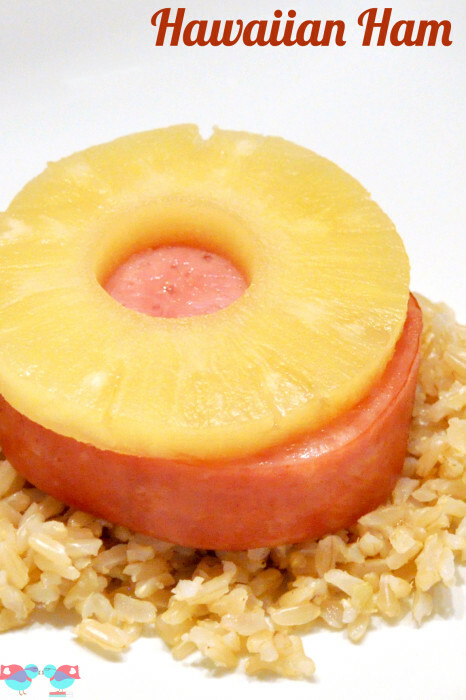 Pour enough pineapple juice to cover the ham at least halfway. Simmer for at least 4 minutes and flip to cook on the other side for 4 more minutes. Add the pineapple slices to the pan and cook for a few more minutes. Done! If you have extra thick ham steaks, you will probably need to cook for a few more minutes to make sure it is heated all the way through. 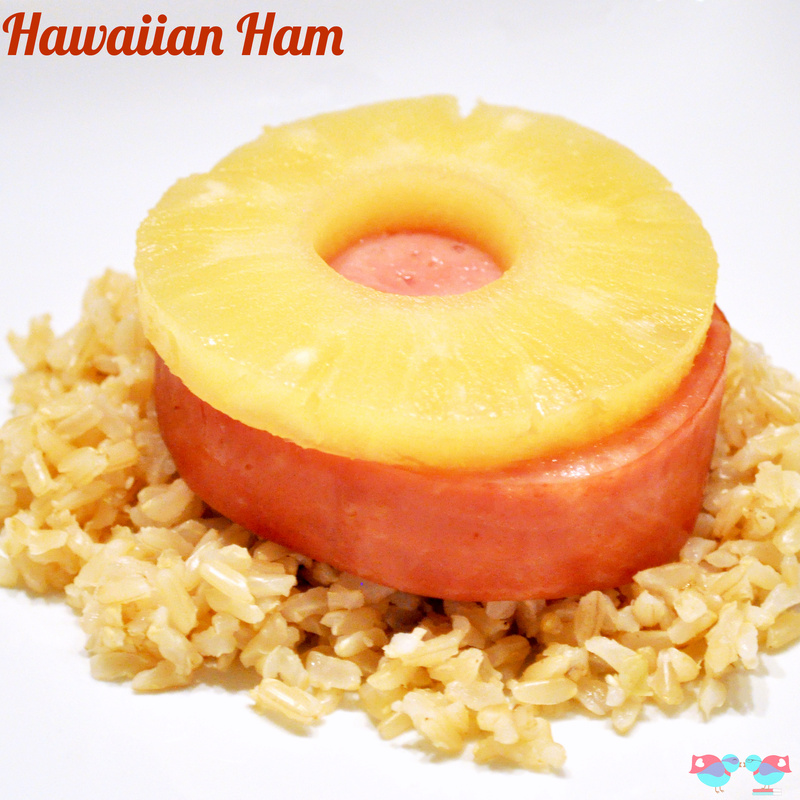 My favorite way to eat this Hawaiian Ham is over brown rice. It is a lighter meal and doesn’t require the oven, so it is a perfect recipe for spring and summer. (I’m just pretending the cold and snow doesn’t exist.) I’ll even let you in on a secret that might get me banished from the foodie blogger community – I use either microwavable bags of steamed Bird’s Eye Brown Rice or Minute Rice Brown Rice. It has really good flavor, and I don’t have to dirty another pot. Lazy, I am. Lazy! Do you have a favorite week night meal? Maggie, I am so happy you made that confession! I, too, frequently use microwaveable bags of rice. Trader Joe’s has some really good ones, but I don’t often get out that way (it is kind of a hike to get there from my house), so Bird’s Eye is my backup! This dish is right up my alley! Pinning and sharing!